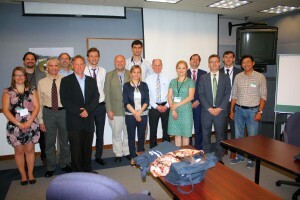 Over the course of their visit, the participants explored examples of the technical and institutional aspects of urban and rural water resources, sanitation systems, water distribution networks and their management in the U.S. The tour included visits to Chicago to engage in issues of local water governance, trans-boundary water issues and policy, and to Southern California, to learn about drought management, water reuse and conjunctive use of groundwater and surface water. The visit was conceived by the Mission in Paris, in collaboration with the IHP Secretariat. ICIWaRM participated along with IHP and the Mission in the selection of the candidates, through a highly competitive process. ICIWaRM also assisted in planning the visit, and participated in a technical meeting for the visitors organized by the U.S. Geological Survey and joined by scientists from NASA and NOAA. The delegation included individuals from Albania, Azerbaijan, Kyrgyzstan, Lithuania, Macedonia, Moldova, Serbia, Tajikistan, Ukraine and Uzbekistan. Three of the visitors were already well known to ICIWaRM. The Ukrainian and Moldovan participants are engaged in ICIWaRM’s project on “Climate Adaptation through Transboundary Water Management in the Dniester River Basin.” Another participant is from Serbia’s UNESCO-affiliated center on “Water for Sustainable Development and Adaptation to Climate Change” (WSDAC). WSDAC hosts Southeastern Europe’s network of UNESCO’s semi-arid regions water program G-WADI, for which ICIWaRM is the global technical secretariat.